Huang, J., Li, G., Liu, Y., Huang, J., Xu, G., Qian, X., Cen, Z., Pan, X., Xu, A., Guo, X. and He, T. 2018. Projections for temperature-related years of life lost from cardiovascular diseases in the elderly in a Chinese city with typical subtropical climate. Environmental Research 167: 614-621. In the words of Huang et al. (2018), "cardiovascular diseases are the leading cause of death and disability-adjusted years of life lost worldwide, placing a great social and economic burden on public health systems." They also note that the underlying mechanisms associated with temperature-induced cardiovascular diseases have been shown to involve "multiple physiopathology regulations, which include cold-enhanced sympathetic reactivity, cold-activated renin-angiotensin system, both cold- and heat-mediated dehydration, and heat stroke-induced systemic inflammatory response," citing the work of Liu et al. (2015). Against this backdrop, Huang et al. set out to investigate the impact of projected future climate change on cardiovascular-related years of life lost (YLL, which incorporates both the number of deaths and life expectancy at death) in elderly persons age 75 and older. In doing so they used a distributed lag nonlinear model to measure the nonlinear and delayed effects of temperature on YLL due to cardiovascular diseases over the period 2008-2015 in Ningbo, China, a large port city with nearly 8 million inhabitants in the Yangtze River Delta of South China. Then, they estimated future temperature-related YLL from cardiovascular maladies in the elderly for the decades 2050 and 2070 by integrating temperature projections from 19 climate models using 3 commonly utilized greenhouse gas emission scenarios (the IPCC's RCP2.6, RCP4.5 and RCP8.5). And what did their work reveal? The exposure-response curve for the temperature-related effects on YLL is depicted in Figure 1. As seen there, the response is somewhat U-shaped. The optimum temperature with fewest YLL occurs at 32.2 °C. Above and below this temperature YLL rises, albeit it rises to a greater degree at the cold end of the observed temperature spectrum. Averaged across the time period 2008-2015, heat-related years of life lost in the elderly due to cardiovascular diseases was 615.4, whereas cold-related YLL amounted to 10,326. Thus, the YLL due to cold temperature cardiovascular diseases are presently 16.77 times higher than that caused by heat. Looking to the future, the authors predict anywhere from a 7 to 27% decline in YLL due to cold temperatures depending on the emission scenario used. YLL due to heat, on the other hand are generally projected to rise (with the exception of the RCP2.6 scenario that projects slight declines). Nevertheless, the combined impact of both predicted hot and cold future temperatures under all three emission scenarios is a 6.5 to 14% net decline in YLL among the elderly by the mid to late 21st century. Consequently, it is clear that cold weather is much more a serious threat to human health than warm weather, and a warming climate will help to save lives and YLL of the elderly, at least here in South China. Figure 1. Cumulative exposure-response curve for the effects of daily maximum temperature on years of life lost (YLL) due to cardiovascular diseases in the elderly (age ≥ 75) in Ningbo, China, 2008-2015. The solid blue-red line and the gray areas showed the mean and the 95% confidence intervals, respectively. 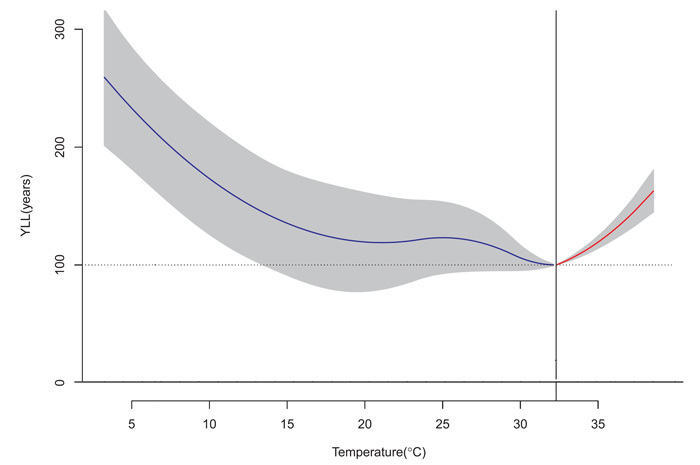 The vertical gray line displays the optimal temperature of fewest YLL at 32.2 °C Source: Huang et al. (2018).